This online app was created as a team project. 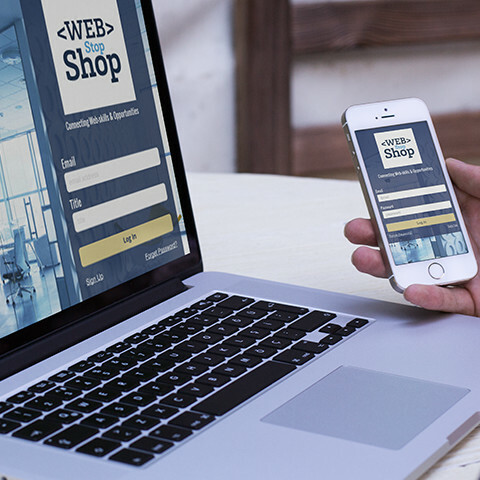 The Web Stop Shop is an app for Web Designers, Developers or employers to find either jobs or employees with the skill sets that they require. Job applicants or employers must first register and can create a profile for themselves or their companies before filling in the other information needed to either apply for, or offer an employment opportunity. logo artwork can be uploaded by employers and photos can be uploaded by applicants. Applicants can also fill out detailed information about their experience, skills and abilities. they may apply to specific job and await a response. Employers can review applicants and view detailed employee skills and either reject or contact an applicant if interested. My part in this project involved front-end development including design, wireframing, mockups, and CSS styling.